Ebb and Flow – Maine. Ocean. Camping. The hot and hazy days of summer are here. There’s a mist hanging over the bay, the porpoise are becoming regular visitors and the cicadas are singing…yup, this is what I’ve been waiting for. 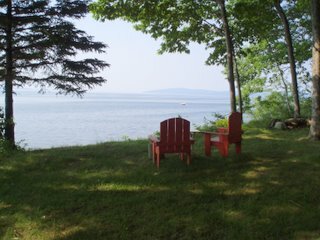 Here on Penobscot Bay we have two high tides and two low tides approximately every 25 hours. They are dramatic sweeps that expose 150 feet of the ocean bottom and keep the Bay flushed and very clean. The tides vary from day to day by approximately one hour so if it’s high tide at 6 this morning, it will be high tide at 7 tomorrow morning. Right now the tides are perfect for sleeping…the waves start lapping the shoreline at about 8 PM and only start to retreat after 11 PM…when I’m sound asleep. With the season gearing up, we generally have the store open from 8 AM to 9 PM. During this time we’re taking care of guest registration, selling gifts and candy, making change for the video arcade and overseeing anything that might pop up. It’s great work but at the end of the day we’re ready for some quiet time staring at the campfire or watching the moon beams bounce off the water. 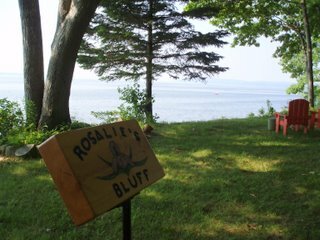 In the summer Steve and I stay at our cabin on Rosalie’s Bluff. 15 years ago I drew it on the computer and with the help of 3 friends and only a small generator for power, Steven built it for me as a wedding present. In my eyes it’s perfect in every way, no electricity, furnished with cherished hand-me-downs and huge windows that overlook the water. In the evenings the only thing to do is light a couple of candles, talk about whatever pops into our heads and listen for the owls. This morning at sunrise Steve got up and made the coffee in the French Press…by the time I got to the Adirondack chairs, he had fluffed the pillows, laid out big chunks of Nancy Campbell’s Apple Walnut Bundt cake, picked a few ripe strawberries from the garden, found my latest copy of Spin-Off magazine and taken the dog for a walk…could life be more perfect? Thinking just a week ahead, some of the details for the upcoming schedule have solidified. Of course we’ll have our Saturday Night Lobsterbakes on the Beach every week through the end of August. On Monday July 2nd I’ve ordered strawberries and heavy cream from Carter Farms and we’ll have a Strawberry Short Cake Social at the beach. Elaine has been preparing an all-day scavenger hunt too so we’ll have the judging and award ceremony the same evening. On the 4th we’ll have our annual float decorating party and trip to Searsport’s Parade and Free Monster Sundaes. The tide is low late that night so we should have a good viewing of fireworks from at least Searsport, Castine, Northport and Islesboro right from the beach. 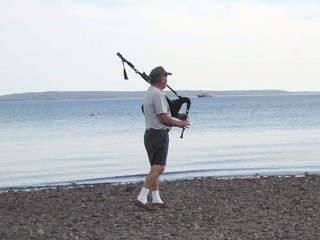 Thursday local author and bagpipe player Tom Seymour will perform at the bonfire…you haven’t enjoyed a summer’s eve until you sit on the rocks, watch the moon come out and listen to the bagpipes echo off the water. Friday we’ll have a silent auction to benefit the Waterville Animal Shelter (J.J. came from there) and if the weather cooperates, we’ll have a flashlight candy hunt for the kids…whew, it’s going to be a busy week. Next The Games We Play! 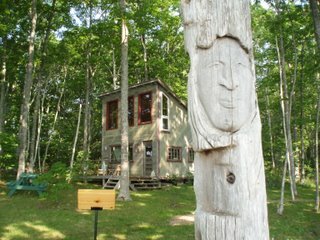 It is VERY hot in new hampshire to!! I can’t wait to get there this fall!! Keep up the blog. See you in the fall! !